What Is Cardboard TRAIN-ing Express? 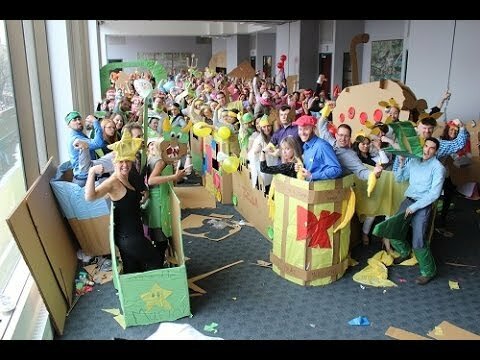 Cardboard TRAIN-ing Express is a hands-on activity that is available anywhere in North America, any time, and for any group size. Together, you and your team will have the chance to design and build cardboard trains, and work together to “power” your creations. It was a very successful team building event and the employees really enjoyed it. They were able to share their experiences afterwards, and it was a great way for them to get to know each other more. Mixing up departments and personalities is no problem for your group. Colleagues enjoy collaborating with one another, and they aren’t afraid to laugh at themselves. Planning a week-long conference for 300 people can become pretty stressful. Watching it all unfold slowly eased any tensions I had developed up until that moment, and I was able to enjoy the afternoon as well without the added stress. From my perspective, the whole group seemed to thoroughly enjoy the competition, activeness and overall landscape of the event. Not only a very successful event, but communications with all of the Outback Team Building & Training team members was excellent. The event worked perfectly with our large group and kept everyone engaged. Want to Learn More About Cardboard TRAIN-ing Express?